Chickpeas: leave overnight in water about 12 hours and soak them sereval times when you can; place them in a colander, rinse under cool running water, drain and transfer them to a cooking pot; cover with water at least twice the amount of the chickpeas and bring to a boil; cover, lower the heat and allow the pot to simmer for approximately one hour; finally rainse under cool water and drain. Mix all the ingredients together and ready to eat. Mediterranean salad recipe and the nutrition fact label were created with Nutrigenic Helper. This meal was added to the personalized food USDA database for using in the patient diets. Also with this software it is possible to get the phytochemical compounds presents in the recipes. This is an example of calorie restrition diet shows that it is possible to include a variety of groups food and cover most of the needs of the daily intake of the recommended nutritional requirements. This diet was created using Nutrigenic Helper. The properties of the diet were analyzed using Nutrigenic Helper a powerful nutritional tool. Today it is well know that nutrients from the diet have on the body physiological and biochemical effects. Also we know that for having a better and a healthier life we need to choose as a part of our lifestyle diets with a positive impact on our health. 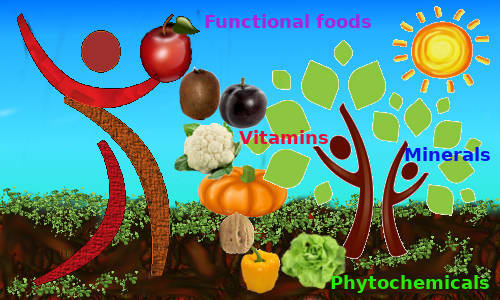 Foods provide us energy, phytochemicals and nutrients to maintain structural and functional integrity of our body. Interestingly, the way we obtain nutrition can have a huge impact on our health, and even our life expectancy; for example, prolonged calorie restriction has been shown to extend average lifespan by 50 to 100 per cent in all species studied, including yeast, worms, spiders, flies, fish, mice, rats, dogs and monkeys. Day to day scientists are making new discoveries about the importance of nutrition in our life and how much nutrition can affect our overall health. In the world there are hundred of diets for fighting against overweight and obesity but most of these diets don’t care about nutrients satisfying the daily nutritional requirements. That is a very bad thing. Good diets with calorie restriction should not imply also nutrient restriction. Good diets should content food with good macronutrients quality and all the micronutrients necessaries for allowing to occur all the physiological and the biochemical processes in our body. For example, it is well know that the lack of vitamin C produces scurvy, the lack of iron is responsible of anemia or inadequate intakes of dietary calcium produces hypocalcemia with no obvious symptoms in the short term. Mediterranean diet with RESMENA macronutrients distribution is an example of a diet that includes a variety of group foods with calorie restriction that satisfy mostly of the daily nutritional requirements. When diets have more calorie restriction it is more difficult to satisfy all the daily nutritional requirements, so in that cases it is necessary to know the nutritional requirements that are in deficient amount to take them as nutritional supplements. In another hand, this diet care about the quality of the macronutrients especially about the ratio of the fatty acids omega-6/omega-3 that is very important for our health. In add to a good planned diet, also it is important to take care about regular mealtimes and the preparation, processing and cooking of food. Mediterranean salad, the recipe at the top of this page, is an example of a meal that has food ingredients that need special processing, preparation and cooking such as chickpeas and rice. Food preparation and cooking influence the nutritional qualities of foods, and potentially their health benefits; these processes can have beneficial effects, for example by improving the digestibility and bioavailability of nutrients, and by enhancing attractiveness to the consumer because of improved texture and taste, and also deleterious effects due to loss of nutrients or the formation of toxic compounds. Changing our diet and following the recommendation of the nutrition science as a part of a new lifestyle, we can get a better life quality and also extend our expectancy of life. Daily Value (DV)), includes both the DRVs (Daily Reference Value) and RDIs (Reference Daily Intakes). The following table lists the DVs is based on a caloric intake of 2,000 calories, for adults and children four or more years of age.